Antamedia HotSpot helps you in controlling and billing your customers for the Internet usage. It can also be used for providing Free Access for customers in your Hotel, Cafe, Restaurant, company etc. Antamedia HotSpot is a Windows PC software and does not require any Client software installation. Upon connecting to your network (using wireless cards or UTP cable), customer will be prompted to enter valid username and password to get Internet access. We strongly encourage you to install HotSpot on SSD drive because it can significantly improve software performance. OS: Windows Server 2008, Server 2012, Server 2016, Windows 7, Windows 8.1, Windows 10. We recommend Windows Server OS 2016 with DHCP and RRAS roles configured within OS. Connect one network card to the Internet router and other one to a device that your customers will use to access Hotspot. If you plan to use a Wi-Fi router to provide access for customers, connect it to Hotspot server pc using its LAN (not WAN) port. Software includes billing, statistics and reporting with many useful features. 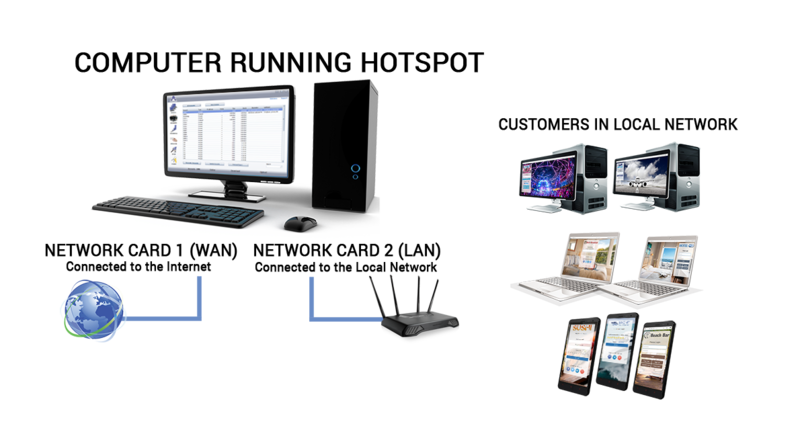 It is hardware independent and you can use any type of access points, routers, switches and other equipment to control your WiFi, WiMax, LAN, Cable, DSL, Satellite and other type of network connections. • Fixed IP addresses are configured on both network cards. Please note that they need to be configured in different IP address range, not bridged. 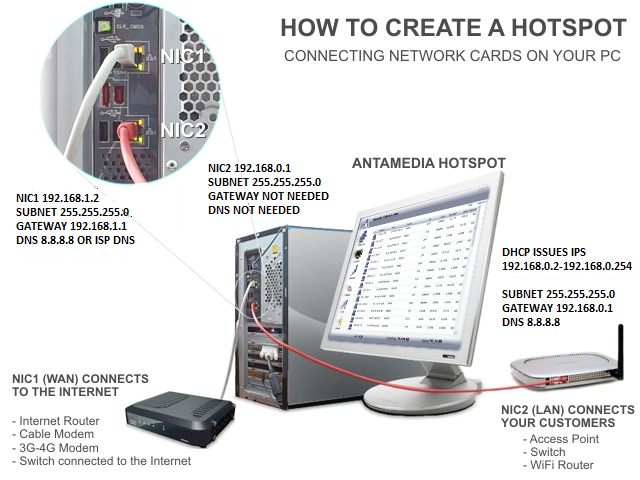 • There are no applications running on Hotspot PC that are using port 80 (web server, proxy server software). DHCP server has to be configured on the Hotspot (internal) network. Note that Internet modem/router cannot be used as DHCP server for your clients. • Set your Wi-Fi router/access point to act as DHCP server for clients. This is recommended option for smaller networks (up to 250 users).